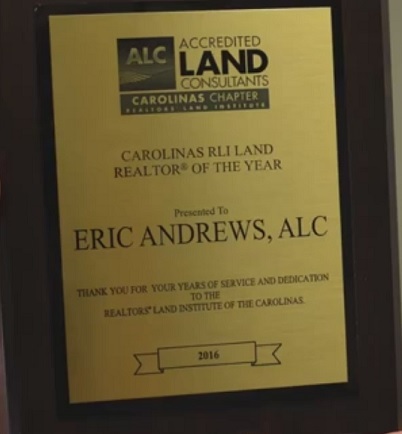 Eric Andrews, much to his surprise, has recently been awarded the prestigious title of Realtor’s Land Institute of the Carolinas Land Realtor of the Year. He was granted this award in honor of not just his phenomenal sales, but his service to the RLI over many years. In years past, Eric has served as the President of the Carolinas chapter for RLI, and has since been reappointed to the board as the education director for North and South Carolina. In this role, he works to get new people involved in real estate, helping them to enroll in beginners land courses, the first of many steps involved in attaining an Accredited Land Consultant certification. The award was given to him on June 28th, 2016 at the RLI meeting in Greensboro, North Carolina.